REPURPOSE 56 is a design study which informs part of Joshua Peasley's MArch design thesis at the Welsh School of Architecture and aims to test localised, small-scale repurposing interventions by designing and building a small social shelter out of entirely recycled or repurposed materials. 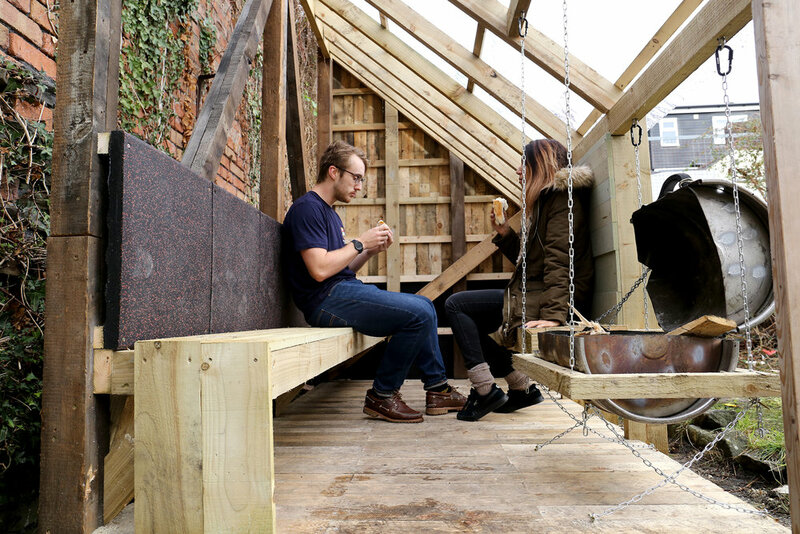 The brief focuses on a space in which people can gather and socialise around a stove or BBQ and incorporates a keg-turned-BBQ which hangs on a bespoke frame from the main structure. The design utilises the surrounding context to maximise material efficiency with the largest facade fronting onto a large brick wall which reduces the need for cladding and provides some radiant thermal comfort from the bricks. The repeated structure becomes more frequent as you progress through the space, naturally drawing you in and creating more privacy towards the rear of the shelter. The gradient of the roof ensures that smoke from the BBQ is naturally drawn out and that rainwater ingress is kept to a minimum. We would like to thank Paul at Dragon Construction and Ben from Ben Vivian Carpentry and Design for their material contributions.